On August 10, 1999, government & industry officials helped a Boeing-led industry team kick off the start of major assembly of the first Airborne Laser flying platform - the 747-400 Freighter - at the Boeing assembly plant in Everett, Washington. Dr. Lawrence Delaney, the U.S. Air Force's top acquisition executive, headlined the milestone event. Team ABL and the Air Force are developing a high-energy chemical oxygen iodine laser carried aboard a modified Boeing 747-400 Freighter, capable of shooting down theater ballistic missiles launched hundreds of miles away. Delaney, who was assistant secretary of the Air Force for Acquisition, along with Boeing and government officials, spoke at a ceremony commemorating the major assembly start. Towering over ceremony participants at the massive Everett assembly plant was a representative 747-400 Freighter airplane nearing completion. Work began today on the freighter's main-deck floor grids, signaling the beginning of major assembly on the ABL platform. Next week, major assembly begins on the wing, and the following week, on the airplane's body sections. This first aircraft designated for ABL is the first to be acquired for Air Force use under the military's new commercial "off-the-shelf" philosophy. The plane also is the third-ever Boeing 747-400 to use a new fuselage assembly process that significantly improves quality, reduces rejection tags and cycle time. As Team ABL leader, Boeing is responsible for creating the ABL surveillance system; developing the battle management, and command and control system; integrating the weapon system; and supplying the 747-400 Freighter airplane. Team member Lockheed Martin is developing the beam control/fire control system, and TRW is providing the chemical oxygen iodine laser, and ground support. "It is gratifying to see that real partnership produces real results," said Paul Shennum, Boeing vice president and Team ABL program director. "This contract was awarded in late 1996, and today we are marking the beginning of major manufacturing of the 747-400 platform for the first Airborne Laser. Air Force plans call for a fleet of seven ABL aircraft to be ready for rapid deployment within 24 hours to any spot around the globe. The fleet's mission is to deter potential use of theater ballistic missiles. More than 30 nations today are believed to have at their disposal more than 13,000 of those missiles. Many of those countries also are known to have or are developing nuclear, chemical and biological capabilities for their missiles. Aircraft No. 00-0001 is the first U.S. Air Force aircraft of the new millennium. During the Preliminary Design and Risk Reduction phase, Team ABL designed, developed, integrated and tested the ABL weapon system. The shavings are embedded in a lucite paperweight in the shape of a dome. 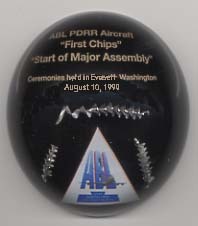 From the milling process, the resulting shavings and chips were collected for promotional use, such as this paperweight. 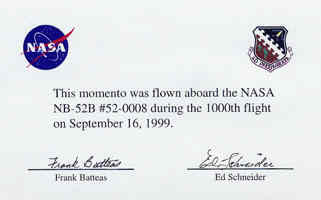 This is one of only 15 covers flown on board NASA’s NB-52B mothership on its 1,000th flight on September 16,1999. Having first rose into the air on June 11, 1955, this aircraft has become famous by dropping some of the most important research aircraft in history. The X-15, many of the lifting bodies, X-38 and most recently the X-43 Hyper-X. This aircraft also has the distinction of being the only B model B-52 still flying as well as being the oldest B-52 in the fleet but has the least amount of flying hours. This cover was cancelled at Edwards AFB on the day of the flight and has been hand signed by the crew as well. 'Balls 8' has recently been supplemented with a B-52H from the Air Force, and was retired on December 17th, 2004. It is to be placed at the northern gate of Edwards AFB, accessible to the public. Powered by two fuel-efficient Honeywell 731 engines, the wide-cabin, high-speed Gulfstream G150 offers the best performance in its class with a range of 2,950 nautical miles. Available in three configurations, this aircraft can accommodate six to eight passengers comfortably. The wide-cabin features stand-up headroom, ample aisle space, and generous seated headroom and legroom. G150 benefits include competitive warranty, training and maintenance programs. On January 18, 2005, the first G150 business jet rolled out of the Israel Aircraft Industries (IAI) manufacturing facility in Tel Aviv, Israel and successfully completed its first flight on May 3, 2005. The G150 received type certification from the Civil Aviation Administration of Israel and the U.S. Federal Aviation Administration on November 7, 2005, the first time that two civil aviation agencies certified the same aircraft on the same day. Following extensive flight testing, Gulfstream determined the G150’s maximum range had proven better than originally projected. Drag reduction efforts resulted in an additional 250 nautical miles and a new maximum range of 2,950 nautical miles with two flight crew members and four passengers onboard. Announced in September 2002, the G150 was first delivered to customers in August of 2006. 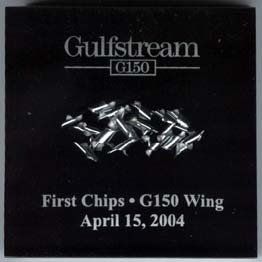 This paperweight contains chips of metal removed from the first parts milled for the wing of the Gulfstream G150. It bears the logo of the project, and the date of the milling. It is 3 inches square in size, and about one inch thick. At precisely 7 a.m. PST, milling machines at Brek Manufacturing, Gardena, Calif., a platinum source supplier to Northrop Grumman, began cutting metal for the fighter's canopy shelf, which acts as a structural fuel barrier between the fuel tank and the forward fuselage cockpit. Simultaneously, Lockheed Martin, the F-35 JSF prime contractor, began milling other major parts of the F-35's airframe at a subcontractor facility in Arlington, Texas. This B-2 Commemorative Patch was flown on Air Vehicle 8, "The Spirit of Missouri" (USAF Serial Number 88-0329), from Palmdale, California, to Whiteman Air Force Base, Missouri, on December 17, 2003, as part of the 10th Anniversary Re-enactment Ceremony commemorating the first production B-2 delivery. The "Spirit of Missouri", piloted by Col. Scott Land, 9th Operations Group deputy commander, and Lt. Col. Rich Vanderburgh, soars over Whiteman during a special flyover re-enacting the original B-2 delivery 10 years earlier. Vanderburgh, a 509th Operations Support Squadron member, was the most experienced B-2 pilot in the Air Force with over 1,500 sortie hours. The crew swooped low over a flight line crowd of 1,500 flag-waving guests, and they delivered their flight documents to Col. Doug Raaberg, 509th Bomb Wing commander. The occasion also marked the announcement by Lt. Gen. Bruce Carlson, 8th Air Force commander, of "Full Operational Capability" status for the B-2 bomber and the 509th Bomb Wing. This signified fulfillment of the original requirements for the bomber. 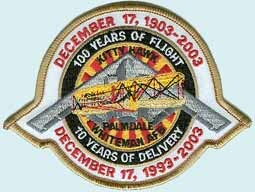 This Wright Brothers "First Day Cover" was flown over the memorial at Kill Devil Hills, NC during the centennial of powered flight ceremony on the morning of December 17, 2003. On December 17th, 100 civilian and historic aircraft were scheduled to fly over during the ceremony, but due to extreme weather conditions, less than 25 completed the flight. This "First Day Cover" (and selected other collectibles to be offered later) was placed onboard a Douglas DC-3, registration # N143D, the final aircraft of the civilian group that flew over the grounds during the ceremony. The "First Day Cover" comes with a Certificate of Authenticity affixed to the reverse. The DC-3 which flew this cover, FAA Registry #N143D, was built in 1937 and, over of years, has had many owners. In 2003, the current owners, Gryder Networks, LLC, of Georgia lent their DC-3 to "Portraits of Hope", a therapy program that combines the healing arts with public art to brighten the lives of sick children. The floral design was painted by over 2,000 seriously ill, disabled or traumatized children in 40 hospitals across the U.S. Once the flowers were painted and signed by the artists, the 10,000-square-foot roll of decal adhesive was laid out in donated warehouse space in downtown L.A. Each of the 100 flowers was then hand-varnished and cut out by volunteers at a rate of one flower per hour. Each decal was then wrapped in special plastic to preserve it and shipped, courtesy of DHL, to Piedmont Triad Int'l. Airport in Greensboro, N.C. There, in a hangar donated by Timco Aviation Services, they were applied to the metal surfaces of the plane. The installation took 400 manhours over one week to complete. According to Portraits of Hope, the "paint job" added just under 400 pounds to the weight of the DC-3. In fact, the FAA awarded a special seven day waiver for N143D to be covered in the sticky decals. AviaPrints™ created a unique First Day Cover for the issuance of the 2003 stamp honoring the Wright Brothers. Each is canceled with the special May 22 ceremonial cancellation, the stamp's first day of issue at Kill Devil Hills. Each AviaPrints™ FDC is printed with archival inks on a No. 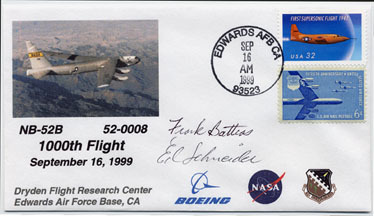 10 sized envelope, and includes the classic image of the first flight. Only 280 of each color envelope they were offered in white and in cream) were created.